This entry was posted in Charlotte, Charlotte Omni, Columbus, John Gilstrap, Jordan Dane, Mexico, NC, OH, One Direction, Tumblr, Twitter by Joe Moore. Bookmark the permalink. Joe– I hope you put 1D in all its forms as keywords on your post. You can also post your daughter’s much viewed photo here too, as an experiment. What a good Dad & family are you guys!!! Reminds me of my crazy Beatles, Herman’s Hermits & Monkeys dayz, close encounters that will be burned forever into a young girl’s brain. Oh & I would bet that YA authors like Suzanne Collins (Hunger Games), Stephenie Meyers (Twilight series), Cassandra Clare (Mortal Instruments series with movie to come) & JK Rowling (Harry Potter) would draw a texting crowd. I saw the advance crowd (fighting over seats) at a B&N for Rick Riordan (Percy Jackson series). He had the whole first floor buzzing with a HUGE crowd that spilled out the door. A precious few authors know rock star status. Makes me proud. Thx for the tip on 1D. I’ll check them out. Just added a picture of the crowd scene outside of the Omni…and, uh, Kathryn and Jordan, you may remember the Beatles and Herman’s Hermits, but I’m old enough to remember seeing Bill Haley and Johnny Ray on television. In black and white. When there were only three channels. My days as a “mop top” are long gone. LOL! BAd choice of a post, Joe. You, “my dear friend”. were in Charlotte with two of my favorite girls in tow, and I never got a tweet, email, or phone call. Gilstrap is in Charlotte, I get a call and we end up roaring in a bar. How soon they forget. I guess I am truly off the map now. You’re a funny man, Joe. Last week, I did a signing in Williamsburg, Virginia–home of my alma mater, William and Mary–and exactly ONE person showed up, a former creative writing professor. It was nice to have a nice 90-minute chat with him at the signing table. John M., I didn’t think you were in the Charlotte/Concord area anymore!!!! Where are you???? And your comments re: JG explain why there was yellow crime scene tape erected throughout the downtown Charlotte area. John G., I have in both public and private forums long decried the deterioration of the Literature programs in institutions of higher learning. Your story is yet another Exhibit A.
I should also note that the young lady, second up from the bottom center of the photo with the blondish hair and the sunglasses perched on her head, is my daughter. Thank God she looks like her mother. 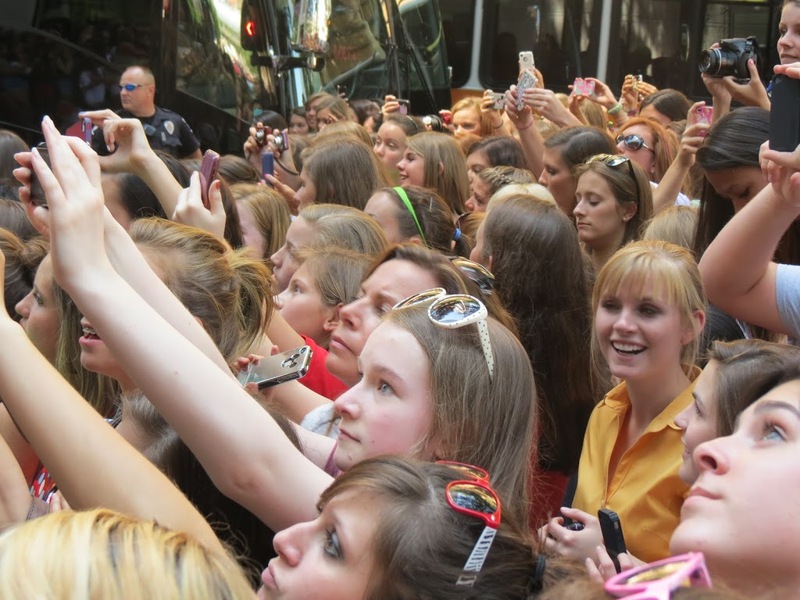 Those girls look so happy–entranced, even! What a good Papa you are for making that happen. Well done! Good story Joe. Its always fun to watch kids having fun like that. While I’ve got only boys, I have a dozen virtual daughters via my church. It always amazed me to see the difference between how the two sexes reacted so differently to excitement. I think that some of the high pitches that excited teen girls can scream at are the reason I’ve lost most of that high range of hearing. I am glad the “boy band” phase of my daughter’s existence has gone to a quiet back street so I can get in sync again. I am 17 miles north of Concord. I would never leave the area. Now I expect a special trip to see me and sit on my porches (both covered) and watch my Ruby Throated hummingbirds (10 today), and my Blue Birds (Six in houses we built) and the dogs and not drink. I don’t jog because it makes the ice fly out of my highballs. Aw, hell, do what you want. It even sounds boring to me. Kathryn, thanks, but I had the easy part. All I had to do was keep hitting the refresh button on the laptop while trying to buy tickets, find a good deal on a hotel room, and get my fam down there and back. My poor wife gets all of the credit. She had to sit through the concert. I bought her earplugs. Basil, are you sure that screaming isn’t from the girls’ mothers, and for you, when you walk in the room? James, I agree. BTW, everyone, look for the New Edition of James Scott Bell’s Book of Puns, coming soon to the vocal groups section of local CD store. John, I’ll call you back as soon as my phone recharges. And no, that doesn’t sound boring at all, as long as Susan’s there, at least. How freaking cool to be ground zero of a flash mob. That gives you like Internet rock-star-dad status. The net has yet to fail to surprise me. A while back, for fun, I started a photo blog called, “Why I Fear Clowns.” In October 2011, I moved it to a photoblog network. Within a month, with little or no promo on my part, I am getting 10K hits a month and I see my clown pics being shared and sampled on FB and other blogs. For six months, I owned the Google search, “decapitated clown cakes.” Yes, I am so proud. I’m currently working on my gallery of feral furniture photos, hoping to launch another blog. Why are we all looking at you like that? Why…just because, Terri! Great story!